Top venting for superior breathability. 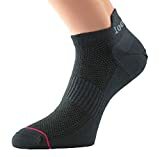 The 1000 Mile Ultimate Tactel® Sock has a Tactel® inner layer to wick away moisture from the skin helping to keep the foot dry. The combination of fibres and top venting helps to maintain a comfortable temperature, with arch bracing offering additional support.